Past the figs, to the washing lines. Where I have plants which raise clouds of fragrance. From the earth and the sunshine, with the alchemy of nature. Lemon verbena, scented pelargonium, Salvia greggei and lad’s love (Southernwood) with its fresh lemon scent. Not the peak oil, gagging chemicals wafting over from my neighbour. 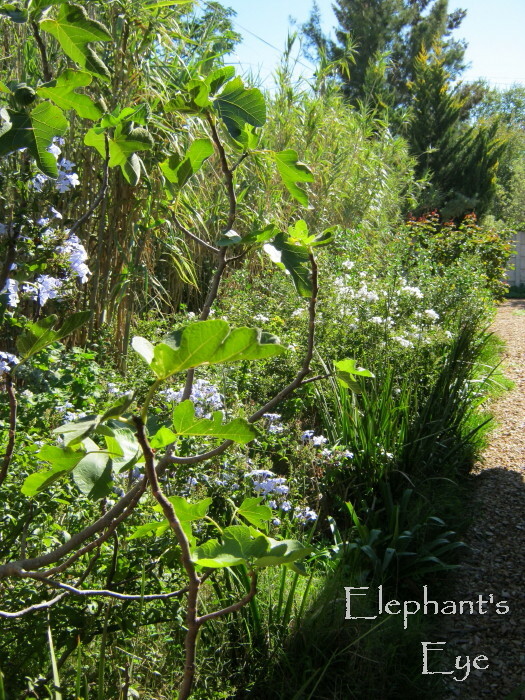 The white Plumbago, which only weeks ago ‘wasn’t sure if it wanted to go on growing’ (thanks Esther) is covered in flowers! Apple Creek enjoyed being groomed. The dwarf papyrus is paddling in the last of the rain, and the reed frogs are clicking thru their repertoire. 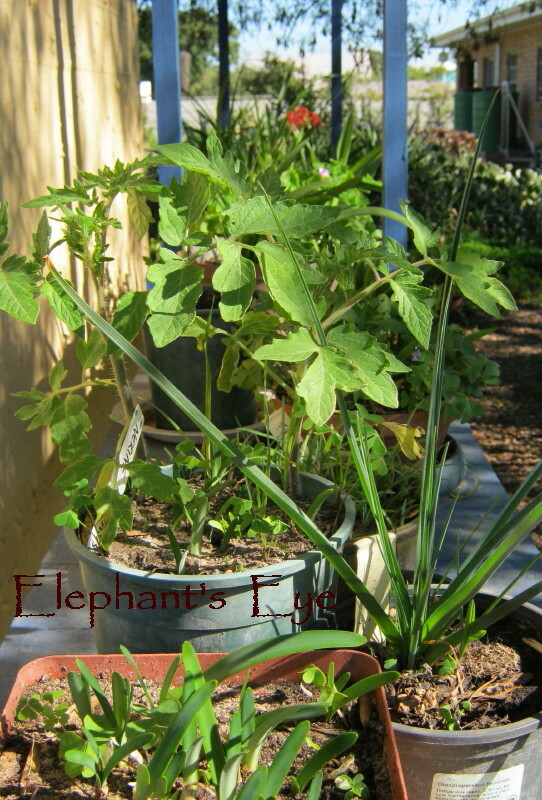 In my pots of mostly indigenous bulbs, I have acquired two healthy tomato plants. The ash planters have gone from dubious to vibrant green spears of Chasmanthe, ruffled collars of Veltheimia, a carpet of leaves from the assorted tiny bulbs, all woven together by acid drop yellow Oxalis. 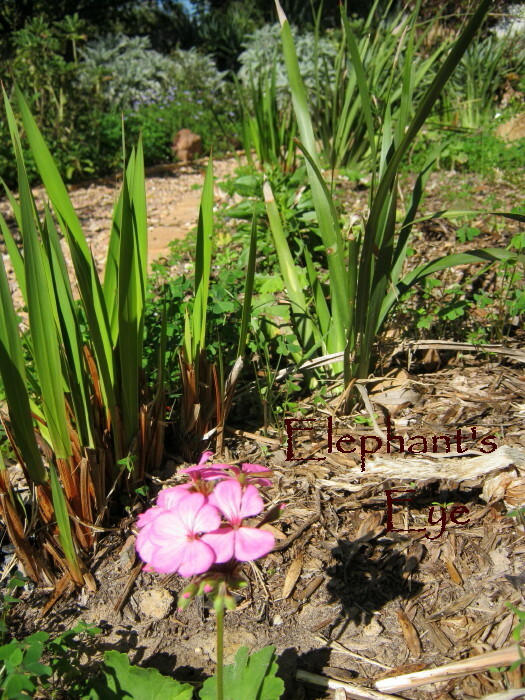 My embattled once was fynbos is going to be pink. There were March lilies, there will be watsonias. 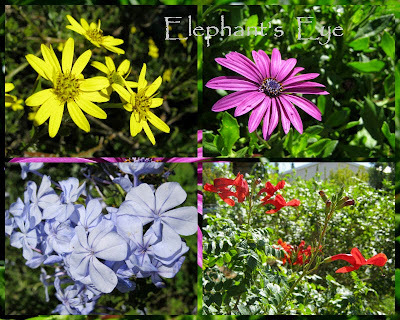 I have added lots of cuttings of shocking pink pelargonium, and two tone pink Dimorphotheca jucunda. 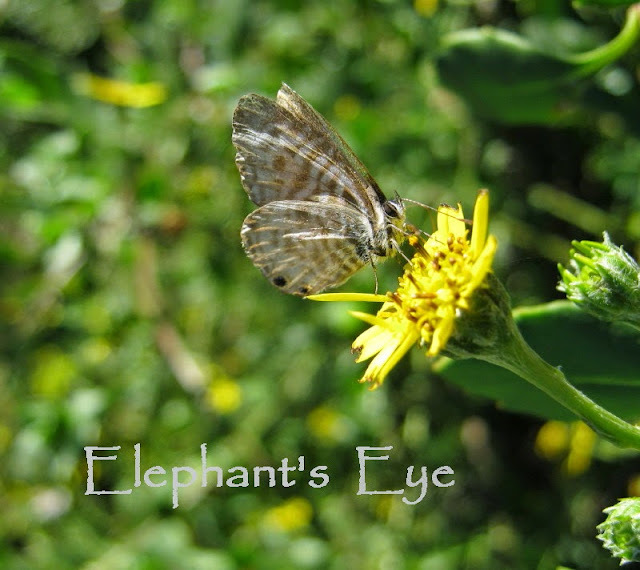 Walk around Ungardening Pond, looking at Rest and Be Thankful. Settle with a cup of tea, next to the waterfall, while our wild birds putter and chirple thru their day. 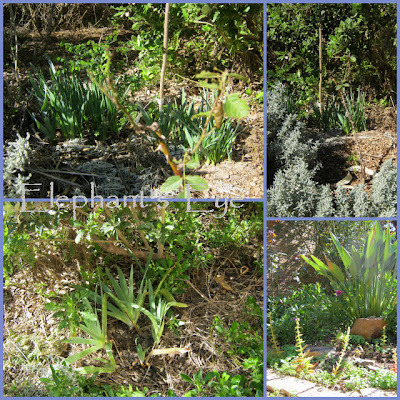 At Paradise and Roses in my Winter Chill bed I have Great North (lushing out since I removed the nearest Dusty Miller). A white iris from my mother’s gardening friend Celeste. An armful of Narcissus from Anna, are spearing thru. In Autumn Fire I am nurturing an orange Crassula. Spring Promise has fresh leaves on the Melianthus, which I treasure twice, because you love it too. Summer Gold has acquired Celeste’s yellow iris. I am learning to let go of the old and storied rose varieties, that battle with the heat, leaf loss and sunburn. Choosing the disease resistant modern varieties, WITH fragrance – like Perfume Passion which has a layer of buds at shoulder height now. When we sit at Paradise and Roses there will be velvety red Duftwolke to our left. The the wide view is foliage and texture ahead of the 16th and Pam’s Foliage Followup. The dividing line between the Karoo Koppie and the Blue Border never was a Line. 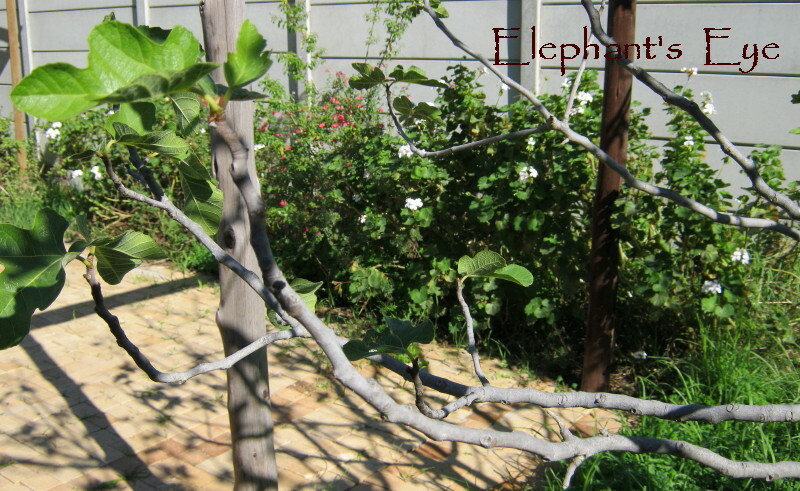 Now I have planted a row of spekboom cuttings. Which will lend themselves to formal trimming. While remaining green in summer. Tidying at the front door to reveal my alternating clumps of Dietes spears and Agapanthus bowing, I ripped out the Felicia by mistake. 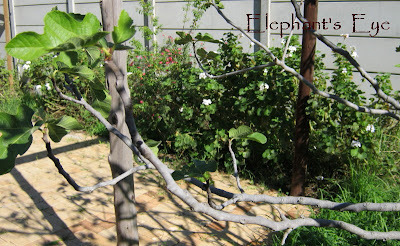 Those harvested cuttings are now a second blue line by the spekboom. The informal hedge dividing ‘meadow’ with plum trees from Paradise and Roses had also reached its sell by date. Standing almost waist high it was a barrier, not an invitation. Now I have a thickly planted row of hand-sized Dusty Miller cuttings, paired with a row of Scabiosa cuttings, across Winter Chill and Spring Promise. For now it is just promise, but a gardener’s eye sees far. Our garden is dancing into the ball. Everything is either in flower or covered in buds. Colour every which way. Thank you for these long view peaks into your lovely garden. It is so wonderful to see gardens all around the world. such beautiful photos, thankyou for sharing, I have been reading all your past posts to catch, up.Best wishes from Canada! Diana, I loved the trip through your garden. I especially liked the picture with the Ash Planters - a lovely place! Lovely to see long views of your garden, makes a nice change from all the macros that we all take! Your garden is looking very lush and green at the moment, very cooling in your heat I would imagine. Your May garden is beautiful Diana!! I love the ash planters and the pots with the bulbs, the Dianthus, Melianthus, Irises ... the birds at the pond ... I am sooo envious and in awe! Wonderful, wonderful result of all the care and love you both put into your garden. Are the tomatoes a first for you? They are such eager volunteers,coming up from our home-grown compost. I'll have to plant them with gratitude. Cosy, comforting, intimate perspectives, thanks. 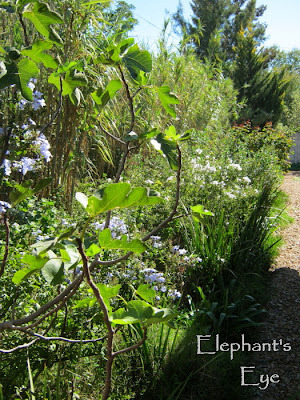 May is such a lovely time for WC gardens and yours is looking beautiful. It is such a contented sigh of relief garden time. Now, what shall I do today? A little editing among the roses? Such charming washing lines! And it's a brilliant idea to surround them with heavily scented plants. I wish I used my garden as efficiently as you do. That was a 'borrowed from a visited garden' idea. Another friend had a carpet of camomile, but we need paving against winter clay mud gloop. I know what you mean, Diana, about weaning yourself off macros. I find it much more challenging to photograph whole garden scenes. Out of all of the photos and descriptions, I think my favourite is "Apple Creek. The dwarf papyrus shining like stars in the foreground, I can almost hear the frogs clicking. I find it fascinating how light is different in different areas of the world. 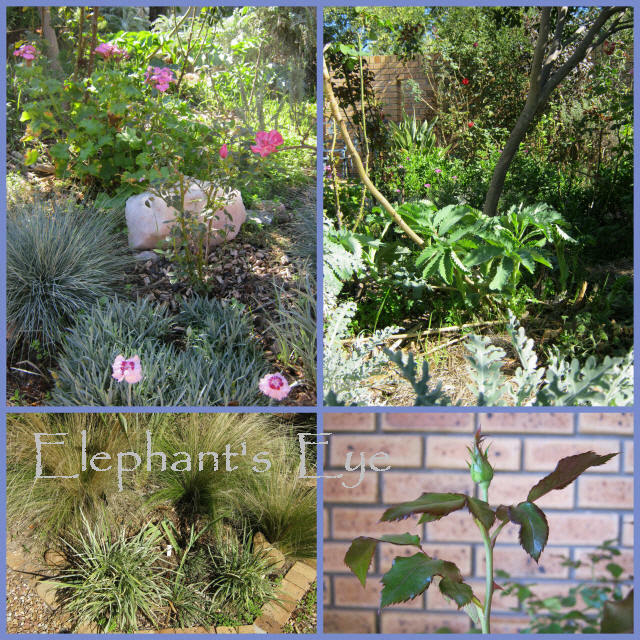 The light in your photos is so different from the light in my northern hemisphere garden. You have a lovely garden. I especially like the Ash trees. A non-native beetle destroyed our ash trees. Our ash trees came with the land. About 30 years old. 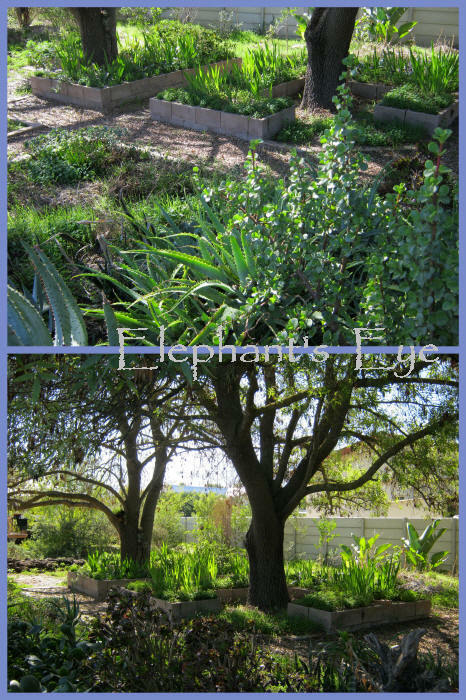 It is always amazing to have the chance to see gardens in all parts of the world ..if I want... and I am glad you chose a wide angle to show us around your garden. I love the scenery under the trees, but I do not quite understand what 'ash planters' mean in that context, are the planters made from ash tree wood ...or are the trees ash trees..which I doubt very much?? Sisah - the man who planted the trees 30 years ago told me, carefully (Afrikaans was his first language) that they are 'mountain ash trees'. The planters themselves are simply dry stacked concrete building blocks. Oh, everytime I come here I learn something new. I did'nt know you can embed replies to comments directly in blogspot-blogs. And arranged it on my blog, too. Thank you, Diana. Also new too me is there are ash trees in south africa, since to me Fraxinus excelsior -which is the typical ash tree for this region- is a tree which needs moist grounds. The name of the road I am living is called ash-alley- therefore my interest ;-) Those montain ash trees in your garden look a bit like Eucalytus trees to me. They are northern hemisphere trees, used for street planting in our town. And they battle thru our summer! went to look it up - mountain ash is rowan with berries. Ours must be just ash. No berries! Despite many familiar plant names when I try to see them in your photos I can't. Take a plant out of its familiar setting and it's like seeing a whole new plant. That's part of the pleasure of visiting gardens on the other side of the planet. What a lovely walk! I enjoy seeing all your gardens. They are so lovely. 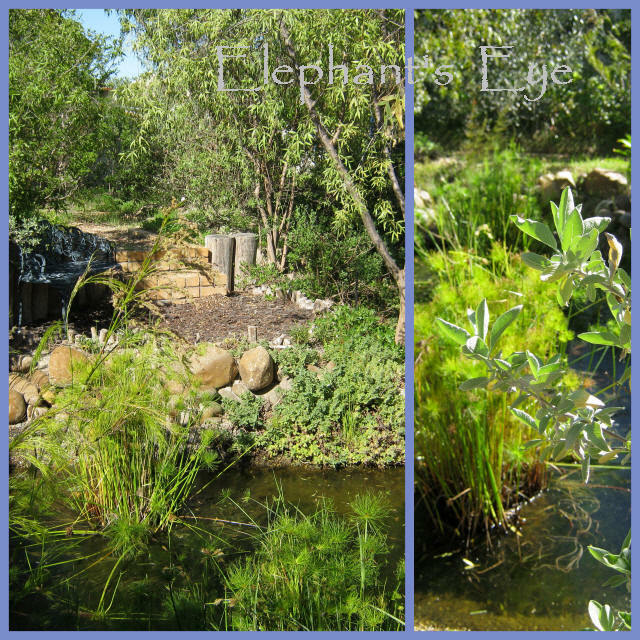 This week I did some "weeding" of our pond and removed all the overgrown watercrest so I could enjoy my own pond's form a bit more. You've inspired me to want to do more. I enjoyed the tour of your garden, and in the long views I do get a sense of Africa! I would love to Rest and Be Thankful in your garden! Among all your areas, that could be my favorite, though I probably would also spend too much time playing with the railway! Also, you asked about my rain barrel/urn. Since it is not connected to a downspout, it would take a long time to collect water via rainfall, so I have pre-filled it and it will be used as a reservoir to keep the water handy, though it is nice to know that some of the rainfall we have had today has gone into the urn! Your garden is looking lush and inviting! A cup of tea by the waterfall, with birds chirping in the background. Sounds marvelous! Love the long shots Diana. 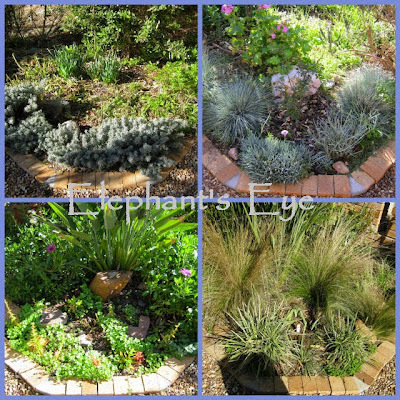 Your ponds are so interesting with so many different kinds of plants, it's nice to see the whole picture. I love seeing the golden light return to your garden in autumn, Diana. It's radiating respite these days and looks beautiful. I'm astonished at the contrast with the photo you showed of the ash planters a couple of months or so ago. Your astonishment is mostly due to Chasmanthe. Those fans of green swords grow as you watch. 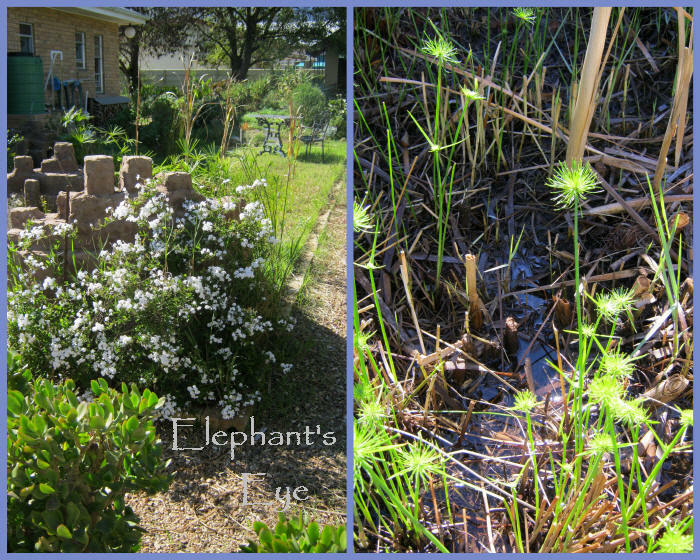 There is so much going on in your garden, and like Deb, I get a sense of Africa from the long shots. I let go of a lot of roses in the past because they just require too much care and seem to suffer so much during the growing season. Your cats are so comfortable in the garden. My cats go out with me every day in the garden and love it. They wait by the door until I get there to open it. Ours have their own door, but little old lady Aragon prefers to be with me. Open door to the sunny garden, and she is curled up in my favourite chair across the room. Happy GBBD, Diana! Your white plumbago is looking rather happy. It's on my list of must have plants. I had a chuckle when you mentioned weening yourself from the macro shots...it's something I struggle with. The wide shots just never spark my creative side like the macros but I know readers appreciate a wider view occasionally. Something for me to work on. begin to wonder from what I read about cameras if it is partly an artefact of our digital cameras. You need to be a serious photographer to get the depth of focus in a wide view of the garden. We all battle. Ah but winter, no frost, some rain, is when our garden explodes into party mode! Obrigada! My first Portuguese comment. I enjoyed the wide views of your garden -- great texture and leafiness indeed! Thanks for joining in for Foliage Follow-Up, Diana. 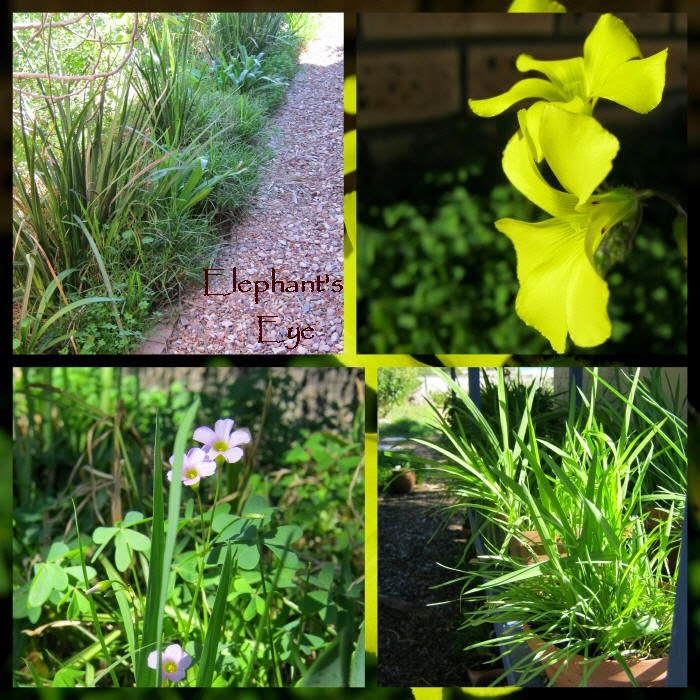 Thanks for another great tour around your garden. Mine is probably a bit upset with me for not giving it much attention lately, but hoping to step it up through the winter. Winter IS our get out there and garden season. Summer is just hanging in there, waiting for better times. A nameless cat attacked him, wound went very nasty, to the vet for an antibiotic injection. Now he just needs to grow over the scar. Poor cat, I am glad that you explained what happened to him, and I am happy to hear that he is healing.